Happening each Thursday night: A fun, high intensity workout just for the ladies! Get ready to get your heart rate up, burn fat, and tone your entire body. These sessions are for all abilities and fitness levels. Workouts change every time to keep your muscles guessing and keep you engaged. Instructors will provide guidance on proper form and keep you moving in a fun, nonjudgmental environment. 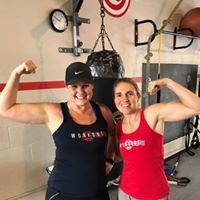 Ladies night bootcamp from judi on Vimeo.